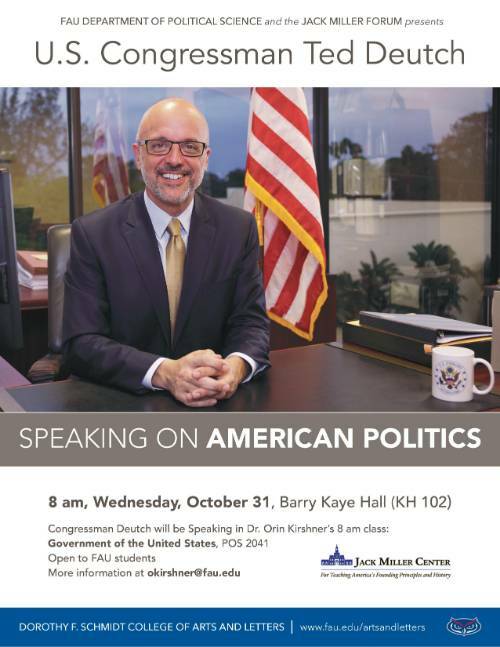 Each year, the Jack Miller Forum hosts a speakers series that is open to all FAU faculty, staff and students as well as the South Florida public. Presentations are made by Florida Atlantic University faculty and visiting professors from other universities. Speakers to date have included, among others, Dr. Stephen Engle (FAU, History Department), Dr. David Niven (Wright State University, Political Science), Dr. David Zerefsky (Northwestern University, Communications), Dr. Thomas Walker (Dartmouth, Political Science), Dr. Benjamin Storey (Furman University, Political Science),Dr. Mark Bauerlein (Emory University, English), and Dr. James Ceasar (University of Virginia, Political Science).